Tomorrow we are heading to Ludlow to hopefully photograph St Laurence's Church and perhaps the castle. I still can't find my camera battery charger and am waiting until pay day before forking out for a new one. It is admittedly agonising not having my dSLR to hand, thank goodness R has let me use his, but I am looking forward to shooting on film tomorrow. Since leaving university and therefore leaving behind access to darkrooms I haven't used film much at all, however, we've finally found somewhere reasonably priced to develop black and white films so I'm going to give them a go and see how they come out. Then I will inevitably drift off into a reverie haunted by dark room fumes and start planning where we can create a dark room, under the stairs perhaps?! Although I'm still convinced there is a basement down there somewhere and must have a look under the carpet! So, in anticipation of more images of sacred buildings I bring you an image of my clear favourite from Florence, the beautiful, quiet Santo Spirito. I'm still working through my photographs from both trips to Florence and I think there is more to come from the Santo Spirito folder, as it is I've only processed one! I didn't get quite the image I wanted but I know a man who did. It is simply beautiful. 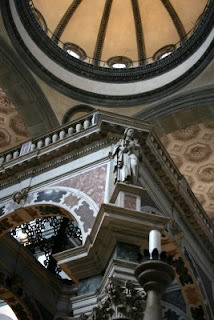 The graffiti on the Duomo walls is right: Brunelleschi is a genius.